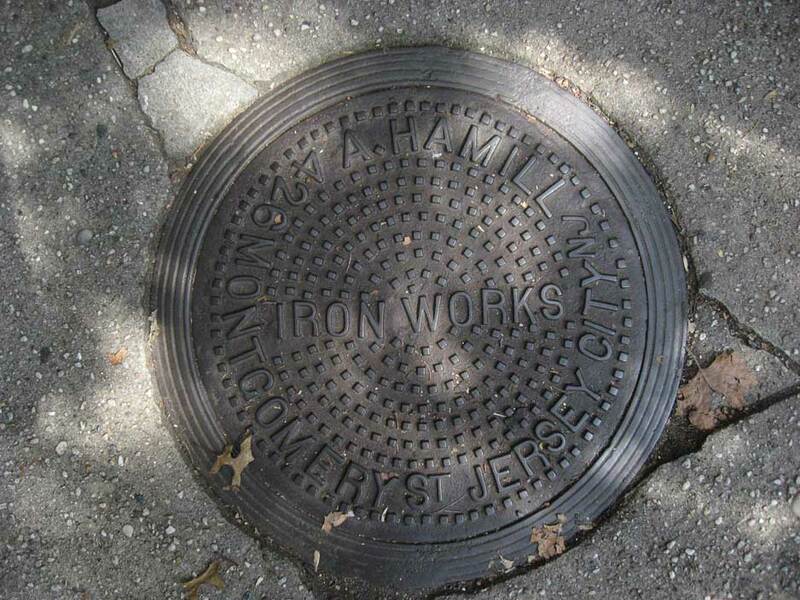 This is one of five coal chute covers along 7th St., Jersey City, N. J., marked A. Hamill. Appropriately, one of the first city directory listings for Alexander Hamill had him living in 1868 at 328 S. 7th St., Jersey City. Alexander Hamill (1847-1901) appeared in both the 1870 and 1880 U. S. Census reports living in Jersey City, N. J. In 1870 he was 24 years old, an immigrant from Ireland, and a bookkeeper. In 1880 he was 33 years old, he lived at 328 Wayne St., Jersey City, and his occupation was "Iron Railing." He also appeared in the 1900 census, when he lived at 141 Mercer St., Jersey City. The census taker incorrectly recorded his last name as Hamilton, and his date of birth was August, 1845. Occupation was "Iron Founder." Prior to being in business for himself Alexander Hamill was in a partnership with Cornelius Burns as Hamill & Burns located in Jersey City approximately 1879 to 1880. By 1883 Hamill appeared in city directories on his own account. This ad from 1889 dates from when Alex. Hamill was located at 68 Hudson St., Jersey City. In 1898 the foundry moved to 426-428 Montgomery St., Jersey City. This ad from 1901 dates from when Hamill was located at 426-428 Montgomery St.. The business survived its founder until at least 1942. In 1907 Iron Trade Review, 24 Jan. 1907, p. 160, reported, "The Alexander Hamill Iron Works, 426 Montgomery street, Jersey City, N. J., has been incorporated to manufacture structural and ornamental iron. The capital stock is $100,000, and the incorporators are: John F. Hamill, 95 Glenwood avenue; Alexander S. Hamill and Cornelius A. Hamill, 300 Varick street, Jersey City, N. J." In 1915 the officers at Alexander Hamill Iron Works were John Francis Hamill (1874-1919), Cornelius Aloyius Hamill (1883-1973), and Alexander Sylvester Hamill (1879-1942), three sons of the original Alexander Hamill. Both Alexander S. Hamill and Cornelius A. Hamill registered for the World War II draft in 1942 when employed at Alexander Hamill Iron Works, 426 Montgomery St., Jersey City, NJ.